Pets come in many different sizes and this also applies to exotic animals. Small pets are appealing for many reasons: they often fit comfortably in smaller homes including apartments, their size makes feeding them less expensive, and when it comes to their potential to harm—this especially applies to alternative pets—they are much safer to interact with (as long as they aren't extremely venomous). Size: The enclosure needs to be small enough to fit in a standard home, and smaller animals tend to be less demanding with space requirements. Odor: Indoor pets shouldn't have an extremely strong smell, although most pets smell at least a little. Energy level: If the animal's energy needs can't be met in its enclosure, it should be relatively well-behaved when allowed out and not so destructive. Exotic pets are defined in different ways, but the most inclusive definition is all animals that aren't dogs, cats, or traditional farm animals. This means that an exotic pet can be a fish, snake, bird, or brown bear. 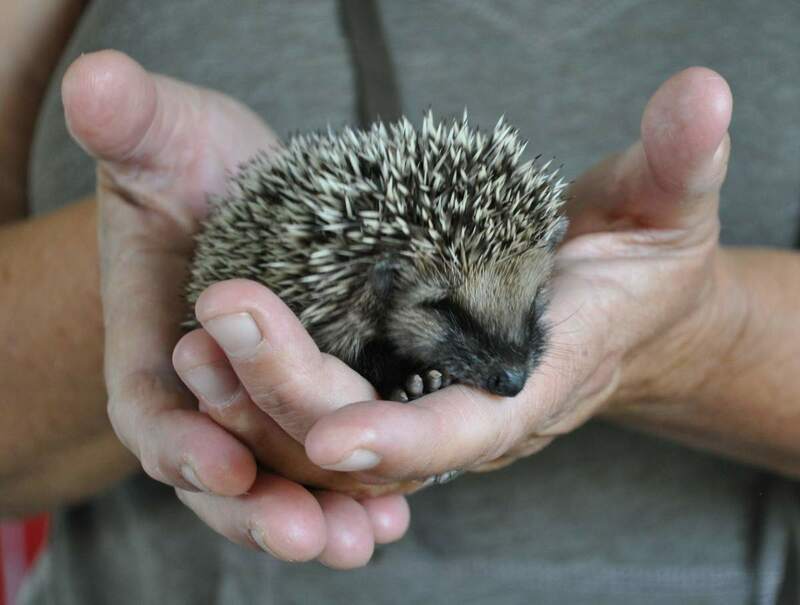 Very common animals that are considered exotic, mostly by vets, include rabbits, guinea pigs, hamsters, ferrets, and animals that are a little more unique such as sugar gliders and hedgehogs. 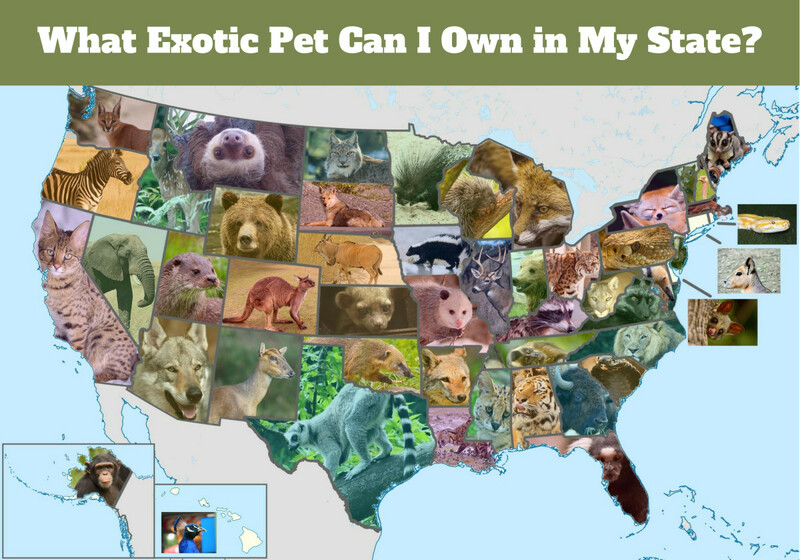 However, few people are aware that certain animals can be kept as pets in some states that are also small and perhaps a bit more challenging to raise. 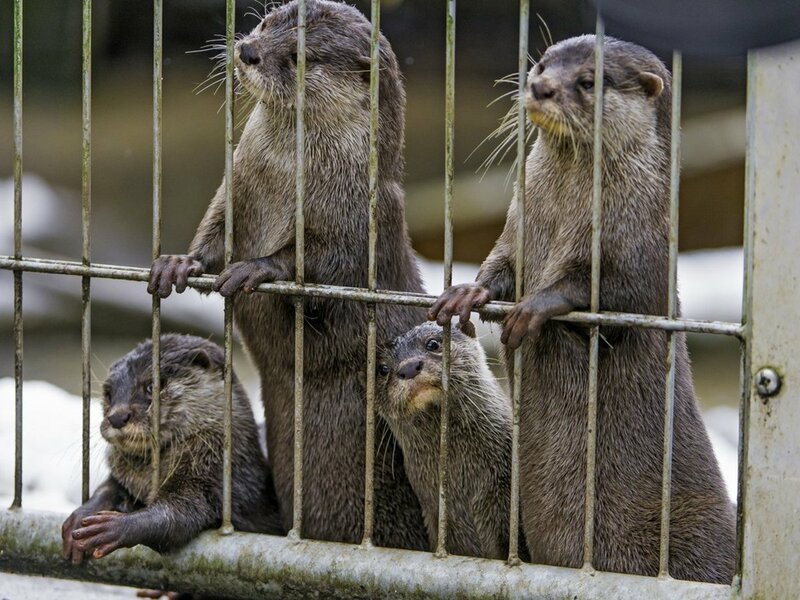 Most would associate these animals as zoo animals or even something that "belongs in the wild," but captive-bred animals, like all other animals, make fine pets with the right owner. Here are a few animals that are "tiny versions" of their more popular, larger counterparts. Exotic pets are not "wild" if they are raised by humans. A socialized animal will usually not behave like one that has been living in natural conditions. This is why nature centers will take in younger wild animals and later state that they are too "used to humans" to be released. 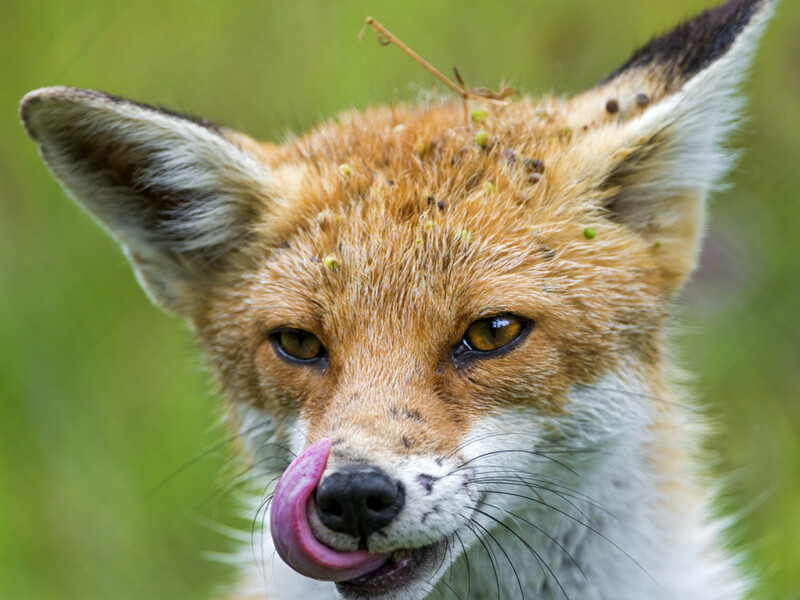 Young carnivores, like foxes, need to learn to hunt on their own and avoid predators. Foxes are popular animals and many species exist in our backyard. 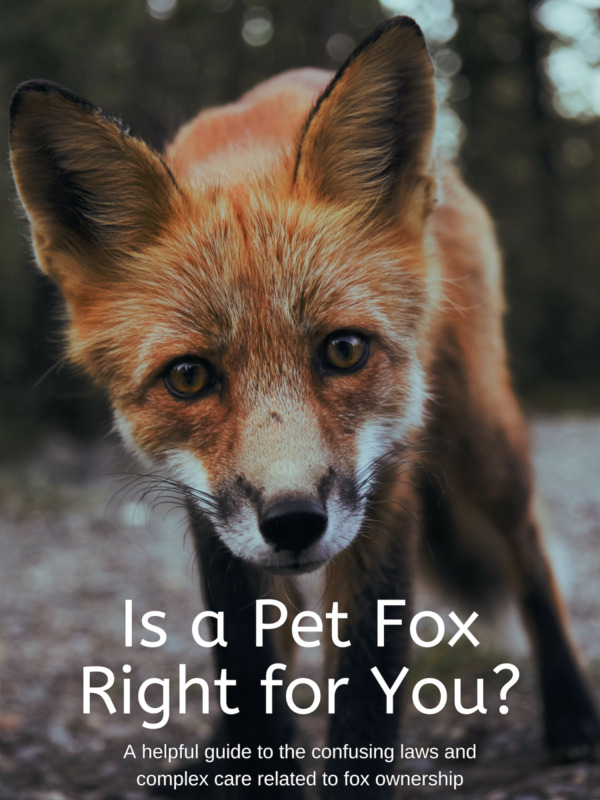 These native foxes are illegal in most states but exotic foxes such as the fennec fox, bat-eared fox, and pale fox, are not only smaller but tend to be legal in a few more states. These desert foxes also have less odor than the iconic red fox of North America. They can easily reside indoors when provided with a spacious enclosure. White-tailed deer are one of the most commonly adopted and confiscated animals. The story always seems to be the same: an abandoned fawn is located and their mother has been hit by a car. A kind and well-meaning couple decides to raise it and it becomes either their confined pet or is even released to come and go as it pleases. The animal is loved dearly. Despite the benefit to both species in this situation, animal control is called by an "anonymous" neighbor and the animal is euthanized, sometimes even in front of the distraught owners. Unfortunately, native deer are illegal in most states. 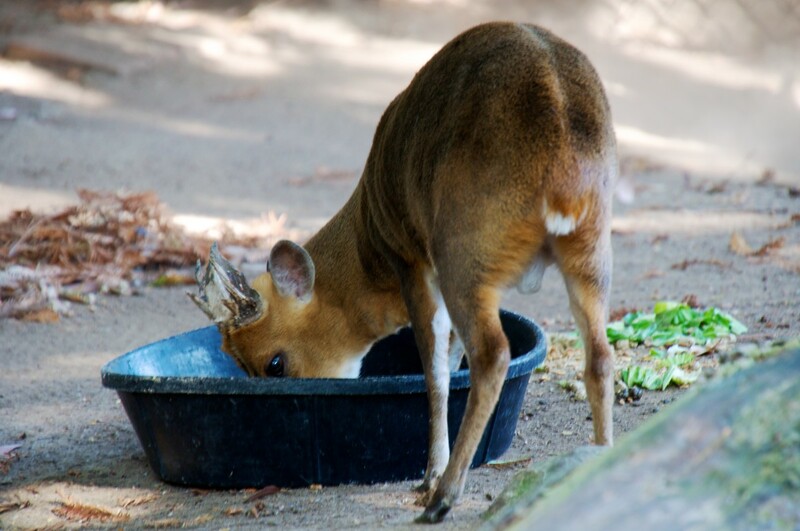 The muntjac deer is a smaller deer from Asia that can even live indoors much like a pot-bellied pig (outdoor enclosures will make keeping them easier). These deer are affectionate, playful, and reach the height of a medium-sized dog. They are still deer, however, and they can not be expected to behave like common domesticated animals. 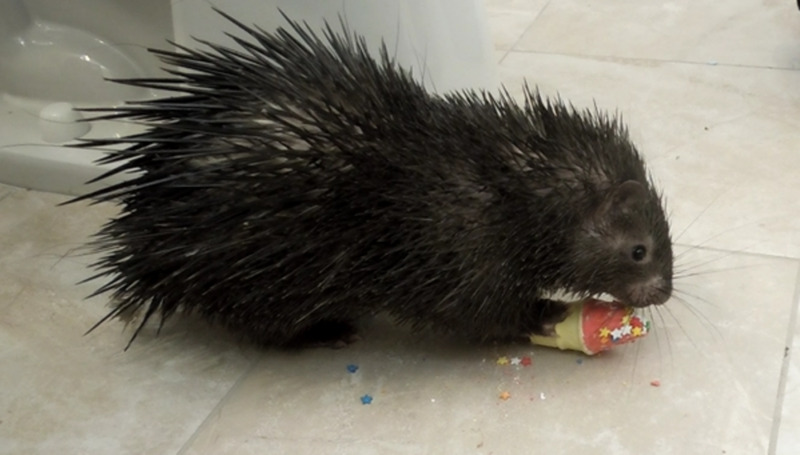 While these Asian porcupines are relatively large, they are much smaller than other species that are commonly available in the pet trade, such as the African crested porcupine, which is one of the largest rodents in the world, and the North American porcupines. Porcupines are notorious among zookeepers for having an odor. In the case of the prehensile-tailed porcupine, it is said to resemble human BO. These Philippine porcupines do not have a continuous smell and only have smelly droppings and urine, and they defecate only 2-3 times a day (in comparison to guinea pigs, this is nothing). 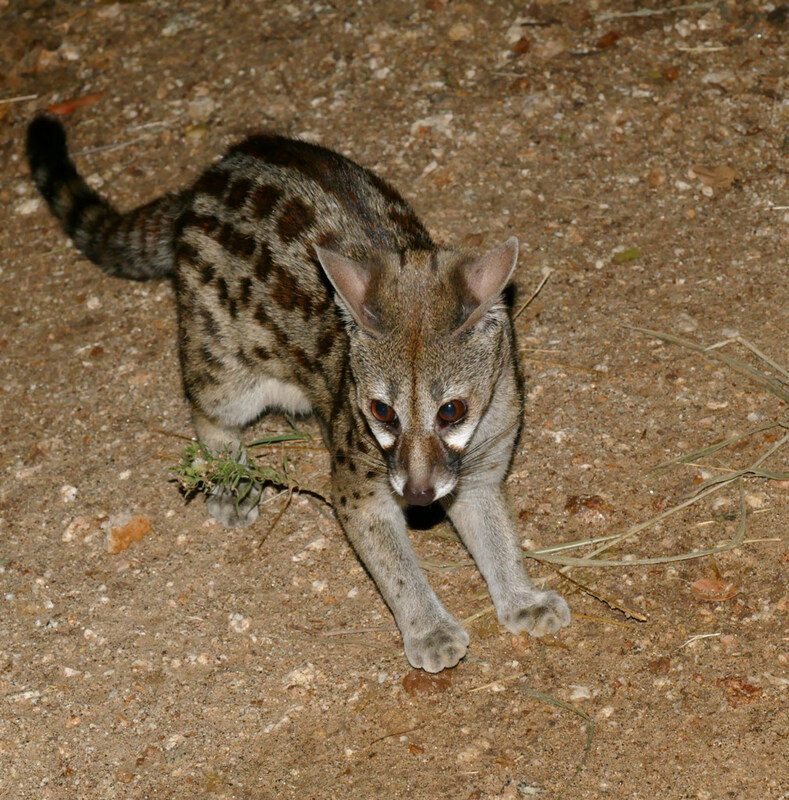 Spotted genets are small carnivores that resemble felines. 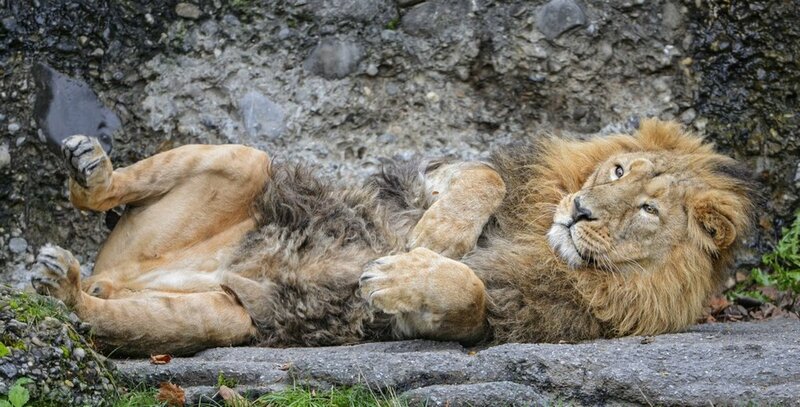 Most exotic felines are either about the size of a Labrador or are the house cat-sized, high strung cats that are more challenging to keep and should have an outdoor enclosure that they can retreat to. Genets are certainly skittish animals and require an experienced hand to properly keep as a pet, but most can be kept indoors depending on one's tolerance to potential spraying (but not all of them spray) and their light muskiness. Genets come in different sizes, but most reach the size of a standard house cat with a much longer tail. 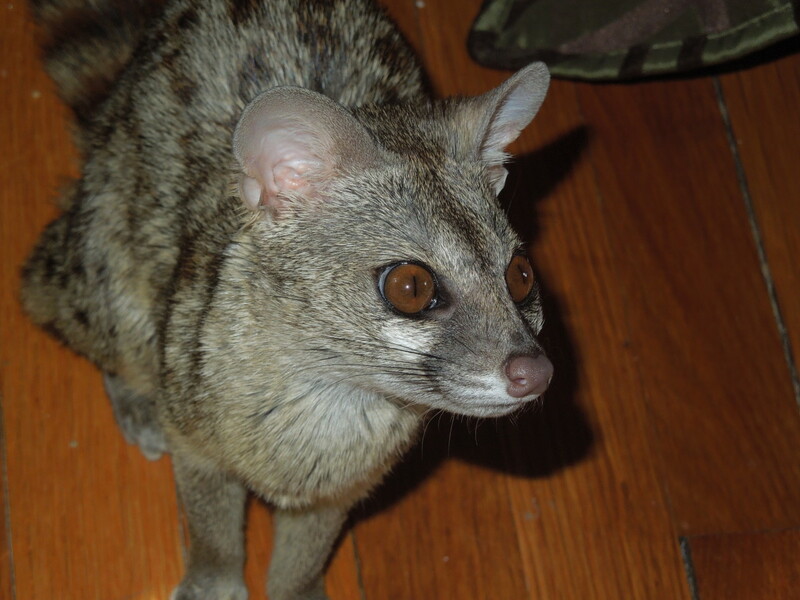 A few individual genets are the size of ferrets, but they are becoming less common to find. 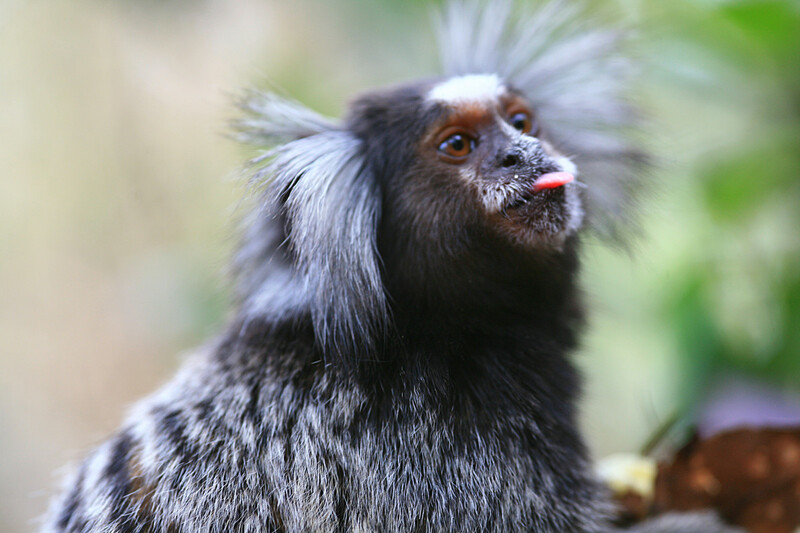 In terms of monkeys, you can't get much smaller than marmosets and tamarins. These small primates have also been dubbed "'finger monkeys" because they are about the size of rat. However, the challenge of keeping primates healthy mentally and physically only decreases mildly with a smaller animal. Their cage doesn't have to be as big as a capuchin monkey's space, but they should still have a spacious enclosure and bigger is always better. Constant daily enrichment and pairings with multiple individuals if possible is necessary. If you are thinking about getting a monkey, the most important issues to consider is their involved care and longevity, difficultly in finding proper vet care, and rapidly growing bans on them as pets. 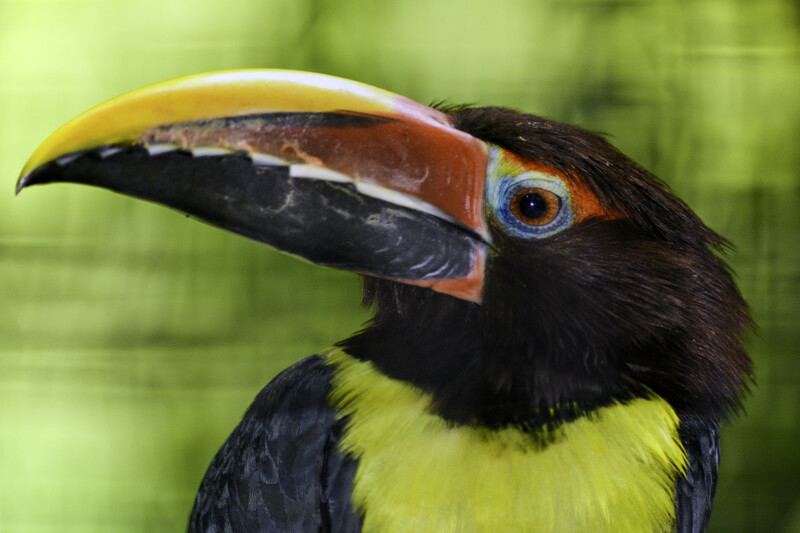 Toucanets and aracaris are essentially "tiny toucans" that can easily be successfully maintained as indoor birds. A wonderful "beginner toucan"' is the green aracari, which are said to be easier to care for than other aracaris and certainly the larger, more recognizable toucans (usually keel-billed and toco toucans). They simply need a reasonable flight cage (for smaller birds), a fresh fruit diet, and constant cleaning (they are very messy eaters). You might be familiar with the larger, North American native opossums with striking white faces and naked long tails. Sometimes they can be spotted lumbering across the backyards of suburban homes or sadly, due to their not so quick nature, as road kill. However, they are fascinating animals that are illegal in most states. 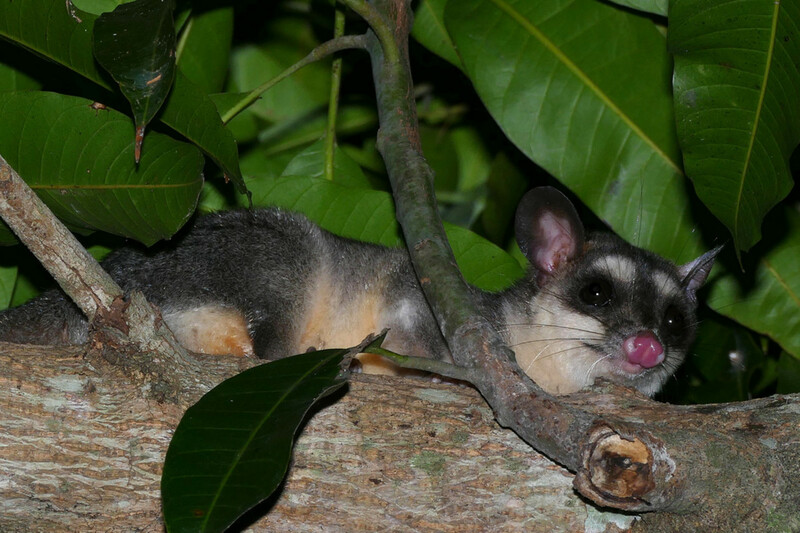 The Brazilian short-tailed opossum is a relatively popular exotic pet that is legal in many more states. In addition to these, there are much lesser known and rare opossum species such as the four-eyed opossum and South American water opossum. These animals are like small versions of the larger North American marsupials and can be kept in large aquariums or spacious rat enclosures. BellatheBall : If I had a penny for every time someone used that failed argument, I could buy another exotic pet. You are definitely wrong and that is a fact. Domestic cats can, do, and will always live outside with little or no assistance. They are EXTREMELY successful and proliferate, affecting the populations of actual wild animals. Did you not know that? It is common knowledge. Have you heard of wild horses? They descend from domestic horses. There are even feral donkeys in Australia. But guess what? Many human-raised exotic pets couldn't survive in the wild without human assistance. In most cases, the environment is not suitable, but being raised by humans, they do not have the survival skills that are acquired from living in the wild. 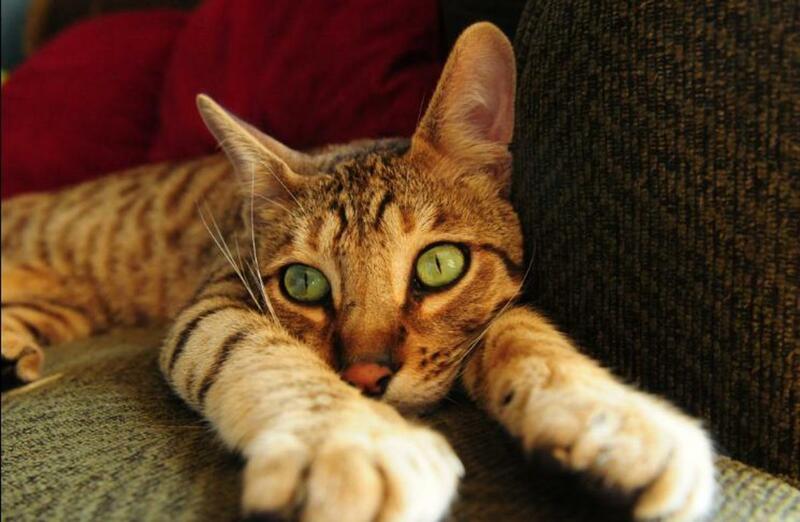 Domestic cats have invaded EVERY state in the U.S. They are BETTER at surviving in the wild than most exotic pets! Still think I'm the one who's misinformed? Didn't you notice I've been writing about this for years? I am not "wrong". You are misinformed. Sometimes humans living near nature may adopt an orphan animal and raise it so that it becomes accustom to living with people. This does not make it a 'domestic' animal. A domestic animal is an animal that cannot live without human husbandry, or assistance. This includes; Sheep, cattle, dogs, domestic house cats, horses, llamas, donkeys, etc. Taking a wild animal and keeping it as a pet is not fair to the animal and is usually done out of human selfishness. This is what I meant by "intentionally" keeping a wild pet. Wild animals belong in the wild where they can live out their lives as nature intended. Domestic animals belong with people as this makes them happy and is necessary for their survival. BellatheBall: Many people think that. They're all wrong. There is no clear line between what you think is a domestic animal and one that isn't. Giovanni Carlo : I have 3 of the animals on this list. The porcupine pictured is mine. I think wild animals should stay in the wild and should never be intentionally kept as pets. It is not fair to the animal. That's why we have domestic animals. Ahhh these are all so cute, especially the little fox! I had no idea that animals like this could be kept as pets. Thanks for educating me! 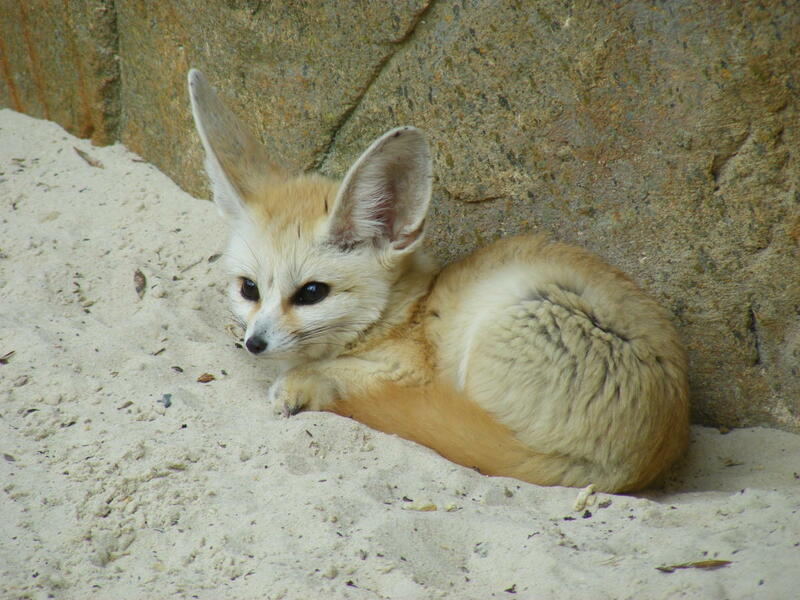 The fennec fox looks sooooooo cute!!! !